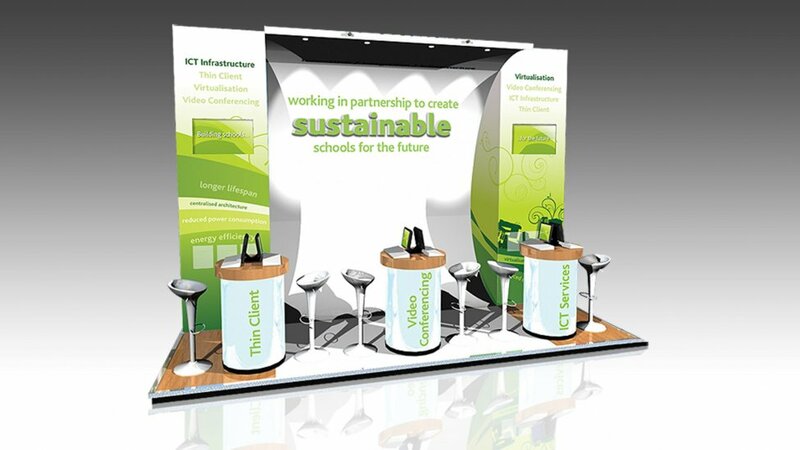 With limited floor space at the Bett Education Show, we maximised budget by building high. With limited footprint to work with, creating the right exhibition booth design to maximise the available space was crucial. And we faced another challenge – the structural column supporting the hall roof was in the corner of our plot, and it couldn’t be modified. With floor space at a premium, we gained impact for the booth design by building high. This approach to the booth design allowed us to showcase our client’s software products with plenty of room for delegates to interact and learn, despite the limited space. Using the maximum 4m height allowance, we built a central overhanging curved wall, evocative of a huge wave. Complete with integrated spotlights illuminating the demo area below, the wave feature – noticeable right across the exhibition hall – gave a sense of movement and flow echoed through the wall graphics. it is possible to fit a ‘quart into a pint pot’. To frame the wave we designed two towers – one on the right to disguise the hall column and house two plasma screens; the one on the left to contain two further plasma screens, as well as provide lockable storage space for PCs, DVD players and internet router, as well as coats and bags. For the demo area we designed and built three cylindrical illuminated pods, each one concealing cabling running back to the store, powering each of the ‘Thin client’ demo screens seated on top.